Lorena Bonnes, age 92, of Alliance, passed away on Wednesday, August 1, 2018, at Danbury Senior Living surrounded by family. She was born December 28, 1925, in Alliance, Ohio, to John Calvin and Lillian (Kleinhans) Henschen. 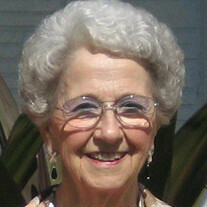 Lorena graduated from Alliance High School in 1943 and went on to work as a teller at Mount Union Bank. On November 12, 1944, Lorena met her husband, Robert Bonnes, who was home on leave from the U.S. Navy, on a blind date. They were married November 12, 1947, while Robert was attending Mount Union College. Upon his graduation from Mount Union in 1950, they moved to Buckeye, Arizona, where Lorena worked as a bookkeeper. She enjoyed singing in her church choir, playing bridge with friends, and baking the family favorite "Mrs. Poto's cookies". Although Lorena and her identical twin, Luella Henschen Walker, lived across the country from one another, they enjoyed spending time together whenever possible. The twins will forever be remembered for their infectious, loud laughing and love for dancing with their husbands. Lorena and Bob lived in Arizona for 63 years before moving back to Alliance in 2013, to be close to family. Survivors include her husband, Bob; daughter, Lynne (Roy) Clunk; grandchildren, Sara (Jason) Robertson of Columbus, Ohio, Laura (Matt) Testrake of Wooster, Ohio, and Amy (Chris) Geocaris of Chicago, Illinois; and five great-grandchildren, Will and Ellie Robertson, Luke and Lillian Testrake, and Vivian Geocaris. She was preceded in death by her parents; John Calvin and Lillian Henschen; sisters, Dorothea and Luella; and brothers, Charles and Bill. A private family celebration of life was held Friday, August 3, 2018 at The Alliance Country Club. The family would like to express their appreciation to Great Lakes Hospice, Paula Moore and the Moore Care staff, and Danbury Senior Living. In lieu of flowers, memorial contributions may be made to the Alliance High School Foundation or Union Avenue United Methodist Church.